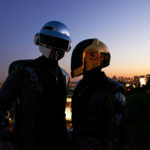 It’s been over two years since Daft Punk released their fourth studio album, Random Access Memories, leaving fans wanting more new music (or at least a couple of tour dates). As the duo continue to keep fans on the edge, a major record executive may have blown their cover by dishing to Billboard in a July interview about their studio time with fellow low-profile artist, The Weeknd. Goldstein’s comment, which can be found in the footage below at the 2:39 mark, doesn’t clarify when exactly the session was supposed to take place, though it correlates with a recent Facebook post from The Weeknd, which features a photo of two metallic Daft Punk-resembling robots atop a speaker.